Piceno and its coast offers an extraordinary gastronomic legacy due to its innumerable excellences based on the tradition of the country. Everywhere you will find typical dishes: from the strong smells of the Adriatic coast up to the specialities and the natural flavours of Piceno hinterland. During an hypothetical gastronomic trip you will meet the prince of sea-dishes, the celebrated Brodetto alla Sambenedettese, a typical stew usually cooked by ancient fishermen with unsold fish. It’s a very refined dish, composed by a good thirteen different species of fish, in addition to a mix of peppers, green tomatoes, vinegar and… big slices of bread. Moving into the hinterland we will find another well-known typical product of our country, the Oliva ripiena Ascolana, a real masterpiece of local gastronomy, that combine together the soft and gently bitterish flavour of Picena stoned olives and a stuffing of different kinds of meat and spices. Among other typical specialities let us mention the famous Maccheroncini di Campofilone, an ancient recipe for egg pasta looking like thin angel hairs, a fifteen-century noble dish. Finally you can sweep over a wide choice of typical sweets, like “il funghetto d’Offida” with its anise fragrance, “le peschette dolci di Acquaviva” and the frustingo” prepared with dried figs, nuts and candied fruits. The viticulture is both an ancient tradition in all the hinterland and the symbol of its rural landscape. It achieved greatness in creating new quality-trademarks, like the latest “Offida-DOC” white and red ones. The most important and famous local DOC wines are the white “Falerio dei Colli Ascolani” and the red “Rosso Piceno Superiore”. 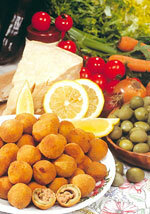 Falerio is a well-known white wine, dry and intensely-scented, suitable for fish and white-meat dishes. The area of production is the whole hill territory. Rosso Piceno Superiore is one of the best red wines in Italy. Sangiovese (60%) and Montepulciano grapes (40%) blended, with a deep and perfumed taste, it is aged in durmast wooden barrels. It is ideal with red meats and mature/aged cheeses. It’s mainly produced in the southern hills of Piceno area from the seaside up to Ascoli Piceno territory. Among the liqueurs the most famous product is the Meletti aniseed liqueur , produced in Ascoli until 1870. It’s a good smell liqueur flavoured with native anise of Ascoli hills.